Everything you may want to know about the memorial is on this web page including historical information about the design, construction and dedication of the memorial, mostly in the form of photographs, together with information and advice on visiting the memorial and fundraising in support of its future maintenance and development. All donations and other financial contributions are accounted for on the 'How to Donate' page listed below. Together, we are remembering them! Visiting the Memorial. Get the most out of your visit by being aware of parking, facilities in the National Memorial Arboretum Visitors' Centre, help for elderly, disabled and infirm visitors and the location of the memorial. There is a charge for parking but entry to the Visitors' Centre and the Arboretum grounds is free, although voluntary donations are welcome. How to Donate. Help is still needed to fund the maintenance and further development of the memorial and this website. On-going costs are estimated to be in the region of £500 per year. Prints. 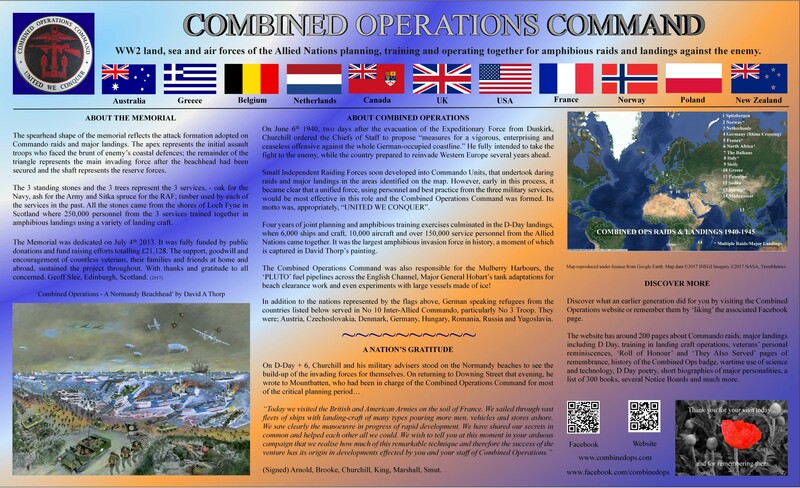 "Combined Operations - A Normandy Beachhead." An evocative painting of a D-Day beach landing by military artist, David A Thorp, generously donated by him to the Combined Operations Memorial Fund. Prints of various sizes are available to order on line or by post, including limited edition prints. Badge Offer. Four colour prints on Buckram paper. A set of four prints of Lt D A Grant's original 1942 design of the Combined Operations badge, printed on buckram paper in colour. £17.00. Only 100 such prints will ever be made. Memorial Archive - Fundraising. See the fundraising wall donations and details of fund raising events. 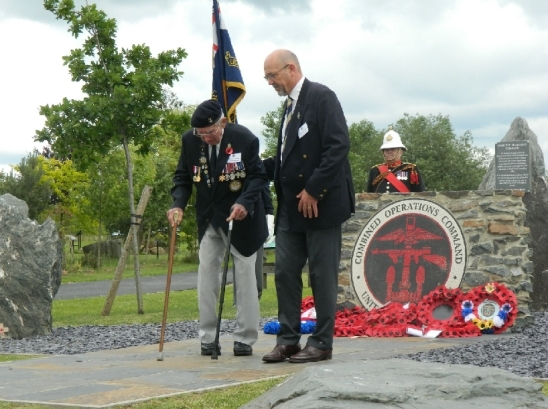 The memorial was entirely funded from public donations in the UK and overseas and from the proceeds of fund raising events - a magnificent example of a successful 'Combined Operation' that raised over £21,000 pounds. Memorial Archive - Design & Construction. See the memorial when it was just a pile of stones in a quarry on the shores of Loch Fyne in Scotland. This was the area where Commandos trained in the rugged mountains and 250,000 Royal Navy and Army servicemen trained together in landing craft operations with air support from the RAF. See the memorial under construction and learn of the symbolism in its design and the materials used. Even the variety of trees used in the design is significant. Dedication Ceremony - A Photographic Record of the Day's Events. It was a heart warming experience to meet and greet WW2 veterans, their families and friends. They engaged in animated discussion with each other in the refreshment marquee before the ceremony as memories flooded back. However, there was a palpable change in the atmosphere as wreaths were laid in remembrance of their fallen comrades and some tears too, exposing the rawness of their memories after so many years. 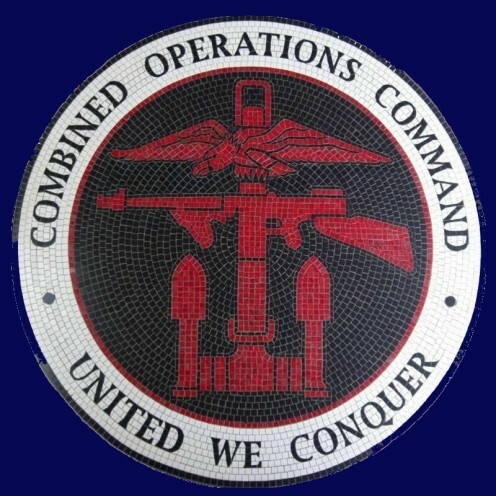 Dedication Ceremony - General Barrons' Speech. 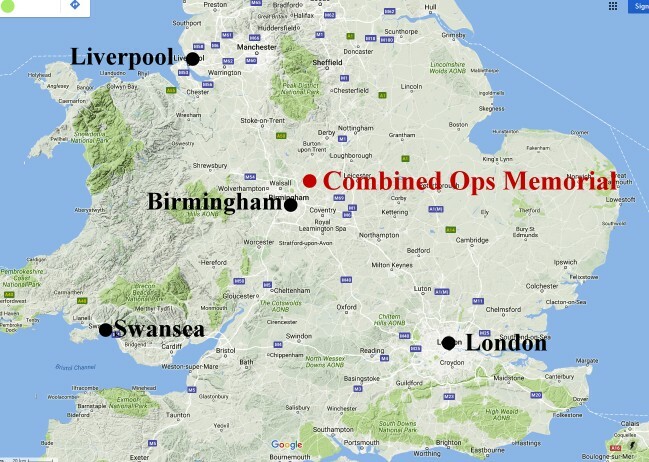 An incisive précis of the history, organisation, development and achievements of Combined Operations and its surprising relevance to the very different challenges faced by today's Joint Forces Command. Special Thanks. To everyone, who contributed to the memorial in donations, fundraising events, support and encouragement... A BIG THANK YOU but especially to... click on link to reveal!